Match.com has been one of the world’s biggest and most successful online dating sites for over 20 years. EliteSingles​ is a newer player on the dating scene, but adds a strong dose of compatibility matching into the mix. But which will reign supreme when they go head to head on the elements that really matter? Signing up to match.com takes under 10 minutes from start to finish. You will be asked some basic info, then prompted to begin filling in your profile with your education, physical appearance, lifestyle and interests. At this point you can also include some ‘Deal breakers’ which help match.com keep unwanted singles from your inbox. Some examples include whether your partner has or wants kids, or lifestyle choices like smoking or drinking. EliteSingles sign up is a whole different ball game. You’ll be asked questions on everything from your past relationships to your sexual interests, as well as what your friends think of you, how you react to stress and what kind of family values you think are important. This is all to create a personality report which helps match you based on core compatibility. While Match is quick and simple, EliteSingles is in depth and accurate. It all depends what you’re looking for! If you’re looking to find an ideally suited match, the step by step nature of the EliteSingles personality quiz and targeted matches make a really easy journey to compatibility. But nothing is simpler than the match.com sign up. In under ten minutes you can be browsing new singles, checking out the latest match.com events, and swiping through eligible matches by a ton of great criteria. We also love that both sites have in-depth FAQ sections, but find the match.com help center easier to find answers on. Chatting with singles is a huge part of checking out if there is chemistry. EliteSingles encourages singles to send inbox messages, smiles and flirts back and forth. They also offer some help with breaking the ice, using questions and some guided communication options. Match.com wins this section easily though, with inbox messages, instant chat, and even the MatchPhone option. This lets you chat without giving out your number until you feel comfortable. The amount of mobile apps match.com has makes chatting on the move a lot easier, too. Comparing these two dating sites on price is complicated, as the services are so different. 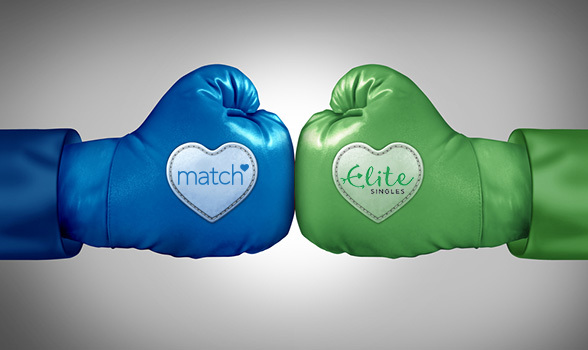 Match.com offers a more competitively priced monthly package, which is $20.99 per month for six months, and includes the Match Guarantee. This promises you six months free of charge if the first six months doesn’t find you a partner. EliteSingles is certainly higher in price, with the same 6 months costing $39.95 per month. But remember, you are receiving more of an elite service with matchmaking, a personality quiz, and manual verification of all profiles. In terms of value for money-we can’t choose. Match.com wins on breadth here, with apps available for iOS, Android, Windows, Blackberry and Palm too. EliteSingles has mobile apps for the two major platforms, Android and iOS, but not for Windows or any other. Their app is a more basic version of the site, meaning you’ll never miss an interaction, but it doesn’t have the wow factor you see with the match.com app and some other mobile designs. Match.com has a number of ways to find the kinds of singles you’re looking for, including a traditional search tool, saved searches, and even a reverse match tool where you can see what kind of singles you are being suggested to. You’ll get SingledOut matches which are more compatible every single day, and you can also play the fun swipe game to see which singles are nearby or you might have missed. EliteSingles has a search tool, but it’s fairly basic-using profile filters only. There is also no keyword search here - something match.com does have. You will receive between 3-7 matches every day, plus up to 20 extra ones once you subscribe. If you’re looking for safety tools, both sites have plenty of security measures in place. Match.com has a dedicated InPrivate mode so that you can browse the site without any members seeing you. They also have phone support where EliteSingles has only email. However when it comes to verification tools, EliteSingles manually verifies each and every profile, and has advanced ID authentication in place as well if you want to show you are exactly who you say you are. Both sites have some safety tips for keeping protected both on and offline, but EliteSingles is the winner here.